Premier quadrimestre 2018–2019 : le cours LMAT1231 – Algèbre multilinéaire et théorie des groupes. I am an editor of the journal Theory and Applications of Categories. I co-organise the Category Theory Seminar which alternates between UCLouvain, ULB and VUB. With Cyrille Sandry Simeu; preprint arXiv:1904.00161. With Cyrille Sandry Simeu; preprint arXiv:1807.03164. A characterisation of Lie algebras amongst anti-commutative algebras, J. Pure Appl. Algebra, accepted for publication, January 2019. With Xabier García-Martínez; preprint arXiv:1701.05493. A comonadic interpretation of Baues-Ellis homology of crossed modules, J. Homotopy Relat. Struct., in press, November 2018. With Guram Donadze; preprint arXiv:1805.07748. A characterisation of Lie algebras via algebraic exponentiation, Adv. Math. 341 (2019), 92–117. With Xabier García-Martínez; preprint arXiv:1711.00689. A note on split extensions of bialgebras, Forum Math. 30 (2018), No. 5, 1089–1096. With Xabier García-Martínez; preprint arXiv:1701.00665. A Seifert–van Kampen theorem in non-abelian algebra, Homology, Homotopy and Appl. 20 (2018), No. 2, 79–103. With Mathieu Duckerts-Antoine; preprint Pré-Publicações DMUC 16-45 (2016), 1–28. Two characterisations of groups amongst monoids, J. Pure Appl. Algebra 222 (2018), No. 4, 747–777. With Andrea Montoli and Diana Rodelo; preprint arXiv:1606.08649. Do n-Lie algebras have universal enveloping algebras? J. Lie Theory 28 (2018), No. 1, 043–055. With Xabier García-Martínez and Rustam Turdibaev; preprint arXiv:1508.06940. What is an ideal a zero-class of? J. Algebra Appl. 16 (2017), no. 3, 1750049 (16 pages). With Nelson Martins-Ferreira, Andrea Montoli and Aldo Ursini; preprint arXiv:1602.08627. A criterion for reflectiveness of normal extensions, Bull. Belg. Math. Soc. Simon Stevin 23 (2016), no. 5, 667–692. With Andrea Montoli and Diana Rodelo; preprint arXiv:1602.02515. Higher central extensions and cohomology, Adv. Math. 287 (2016), 31–108. With Diana Rodelo; preprint arXiv:1502.05282. The Yoneda isomorphism commutes with homology, J. Pure Appl. Algebra 220 (2016), 495–517. With George Peschke; preprint arXiv:1505.05406. Algebraically coherent categories, Theory Appl. Categ. 30 (2015), no. 54, 1864–1905. With Alan Cigoli and James Gray. Further remarks on the "Smith is Huq" condition, Appl. Categ. Structures 23 (2015), 527–541. With Nelson Martins-Ferreira; preprint arXiv:1401.5604. Peri-abelian categories and the universal central extension condition, J. Pure Appl. Algebra 219 (2015), 2506–2520. With James Gray; preprint arXiv:1404.3067. On the normality of Higgins commutators, J. Pure Appl. Algebra 219 (2015), 897–912. With Alan Cigoli and James Gray; preprint arXiv:1312.5474. On the reflectiveness of special homogeneous surjections of monoids, Categorical Methods in Algebra and Topology, Textos de Matemática (Série B), vol. 46, Departamento de Matemática da Universidade de Coimbra, 2014, pp. 237–244. With Andrea Montoli and Diana Rodelo; preprint pdf. Approximate Hagemann-Mitschke co-operations, Appl. Categ. Structures 22 (2014), 1009–1020. With Diana Rodelo; preprint arXiv:1305.1115. A decomposition formula for the weighted commutator, Appl. Categ. Structures 22 (2014), 899–906. With Nelson Martins-Ferreira; preprint arXiv:1304.1331. Categories vs. groupoids via generalised Mal'tsev properties, Cah. Topol. Géom. Differ. Catég. LV (2014), no. 2, 83–112. With Nelson Martins-Ferreira; preprint arXiv:1206.2745. An observation on n-permutability, Bull. Belg. Math. Soc. Simon Stevin 21 (2014), no. 2, 223–230. With Nelson Martins-Ferreira and Diana Rodelo; preprint arXiv:1306.6523. A Galois theory for monoids, Theory Appl. Categ. 29 (2014), no. 7, 198–214. With Andrea Montoli and Diana Rodelo. Hagemann's theorem for regular categories, J. Homotopy Relat. Struct. 9 (2014) 55–66. With Diana Rodelo and Zurab Janelidze; preprint Pré-Publicações DMUC 13-14 (2013), 1–15. Universal central extensions in semi-abelian categories, Appl. Categ. Structures 22 (2014), 253–268. With José Manuel Casas; preprint arXiv:1302.5501. The fundamental group functor as a Kan extension, Cah. Topol. Géom. Differ. Catég. LIV (2013), 185–210. With Tomas Everaert and Julia Goedecke; preprint arXiv:1307.0068. A characterisation of the "Smith is Huq" condition in the pointed Mal'tsev setting, Cah. Topol. Géom. Differ. Catég. LIV (2013), 163–183. With Dominique Bourn and Nelson Martins-Ferreira; preprint pdf. Relative Mal'tsev categories, Theory Appl. Categ. 28 (2013), no. 29, 1002–1021. With Tomas Everaert, Julia Goedecke and Tamar Janelidze-Gray. The ternary commutator obstruction for internal crossed modules, Adv. Math. 232 (2013), 571–607. With Manfred Hartl; preprint arXiv:1107.0954. Higher central extensions via commutators, Theory Appl. Categ. 27 (2012), no. 9, 189–209. Resolutions, higher extensions and the relative Mal'tsev axiom, J. Algebra 371 (2012) 132–155. With Tomas Everaert and Julia Goedecke; preprint arXiv:1206.2946. Relative commutator theory in semi-abelian categories, J. Pure Appl. Algebra 216 (2012) 1791–1806. With Tomas Everaert; preprint arXiv:1108.3909. A note on the "Smith is Huq" condition, Appl. Categ. Structures 20 (2012), no. 2, 175–187. With Nelson Martins-Ferreira; preprint arXiv:1006.1768. Galois theory and commutators, Algebra Universalis 65 (2011), no. 2, 161–177. With Tomas Everaert; preprint arXiv:1104.0518. Homology and central extensions of Leibniz and Lie n-algebras, Homology, Homotopy and Appl. 13 (2011), no. 1, 59–74. With José Manuel Casas, Emzar Khmaladze and Manuel Ladra. A note on double central extensions in exact Mal'tsev categories, Cah. Topol. Géom. Differ. Catég. LI (2010), 143–153. With Tomas Everaert; preprint Pré-Publicações DMUC 09–06 (2009), 1–8. The third cohomology group classifies double central extensions, Theory Appl. Categ. 23 (2010), no. 8, 150–169. On satellites in semi-abelian categories: Homology without projectives, Math. Proc. Cambridge Philos. Soc. 147 (2009), no. 3, 629–657. With Julia Goedecke; final pdf (copyright Cambridge Philosophical Society); additional comments. Simplicial homotopy in semi-abelian categories, J. K-Theory 4 (2009), no. 2, 379–390. Higher Hopf formulae for homology via Galois Theory, Adv. Math. 217 (2008), 2231–2267. With Tomas Everaert and Marino Gran. On the second cohomology group in semi-abelian categories, J. Pure Appl. Algebra 212 (2008), 636–651. A comparison theorem for simplicial resolutions, J. Homotopy Relat. Struct. 2 (2007), no. 1, 109–126. Model structures for homotopy of internal categories, Theory Appl. Categ. 15 (2005), no. 3, 66–94. With Tomas Everaert and Rudger Kieboom. Baer invariants in semi-abelian categories II: Homology, Theory Appl. Categ. 12 (2004), no. 4, 195–224. With Tomas Everaert; additional comments. Baer invariants in semi-abelian categories I: General theory, Theory Appl. Categ. 12 (2004), no. 1, 1–33. Weak (co)fibrations in categories of (co)fibrant objects, Homology, Homotopy and Appl. 5 (2003), no. 1, 345–386. With Rudger Kieboom, Gert Sonck and Peter Witbooi. G. Z. Janelidze, On satellites in arbitrary categories, Bull. Georgian Acad. Sci. 82 (1976), no. 3, 529–532, in Russian. English translation, September 2008, arXiv:0809.1504. Homology and homotopy in semi-abelian categories, Ph.D. Thesis, Vrije Universiteit Brussel, 2006, arXiv:math/0607100. Here are the slides of my talk Categorical-algebraic methods in group cohomology at CT2017, Vancouver, 20th July 2017. Qu’est-ce l’admissibilité de Nelson Martins-Ferreira ? at the Séminaire Itinérant de Catégories of the 31st of October 2015 in Louvain-la-Neuve. Organisation of conferences, workshops, etc. 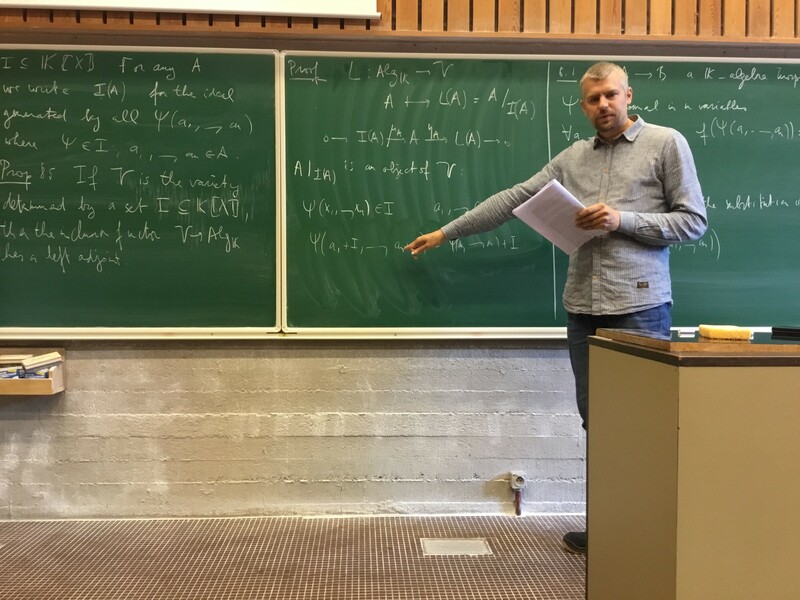 Summer School in Algebra and Topology, Louvain-la-Neuve, 11–14 September 2019. 105th Peripatetic Seminar on Sheaves and Logic, with a satellite event on Categorical Methods in Algebra, Palermo, 17–19 May 2019. Séminaire Itinérant de Catégories, Louvain-la-Neuve, 22 mars 2019. Summer School in Algebra and Topology, Louvain-la-Neuve, 12–15 September 2018. 102nd Peripatetic Seminar on Sheaves and Logic, Santiago de Compostela, 14–15 January 2018. 5th Workshop on Categorical Methods in Non-Abelian Algebra, Louvain-la-Neuve, 1–3 June 2017, on the occasion of George Janelidze's being appointed the 2017 Chaire de La Vallée Poussin. Séminaire Itinérant de Catégories, Bruxelles, 27 janvier 2017. Séminaire Itinérant de Catégories, Louvain-la-Neuve, 31 octobre 2015. Workshop in Category Theory and Algebraic Topology, Louvain-la-Neuve, September 2015. 97th Peripatetic Seminar on Sheaves and Logic, Louvain-la-Neuve, 31 January–1 February 2015. 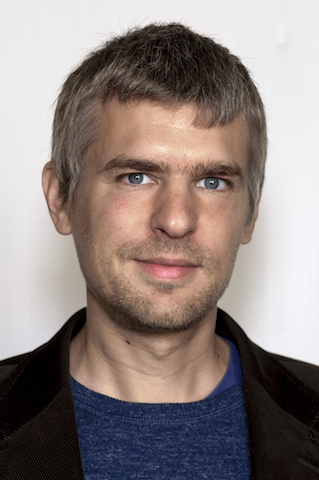 Summer School Category Theory and Algebraic Topology, Lausanne, September 2014. Séminaire Itinérant de Catégories, Louvain-la-Neuve, 17 mai 2014. Summer School Category Theory and Algebraic Topology, Louvain-la-Neuve, September 2013. Séminaire Itinérant de Catégories, Louvain-la-Neuve, 24 mai 2013. Séminaire Itinérant de Catégories, Louvain-la-Neuve, 19 mai 2012. Category Theory, Algebra and Geometry, Louvain-la-Neuve, 26–27 May 2011, on the occasion of Ross Street's being appointed the 2011 Chaire de la Vallée Poussin. 89th Peripatetic Seminar on Sheaves and Logic, Louvain-la-Neuve, 12–13 December 2009. Categories in Algebra, Geometry and Logic, Brussel, 10–11 October 2008, on the occasion of the sixtieth birthdays of Francis Borceux and Dominique Bourn.